Fleet Financial; cutting costs and adding value to customers. Fleet Financial is a contract hire, leasing and vehicle management company based in Belfast and providing services throughout the UK and Republic of Ireland. As subsidiary of Lookers PLC, a dealership doing £3.6bn in revenues, Fleet Financial had to be sensitive to organisational structures and had a lot of their systems handed to them. Their centralised digital setup meant they weren’t able to be as agile as they would have liked with live prices, photographs, and re-listings. We wanted the ability to upload our used cars at speed, create pace across all our channels and a CMS system that could be done by us. Book a slot for a scoping workshop. They typically take 2-4 hours depending on the project complexity. The first question we asked when we saw the 9+ functions of the business was ‘are they all of equal importance?’. This highlighted the main business aims of the sales team and allowed us to create a hierarchy on the site that leant towards the most valuable functions. While the question might seem simple it is often where we start our projects; by defining the value within the business we are able to set targets for our design team that are centred around the overarching commercial objectives. The previous site was limiting the sales team due to its inaccessibility. In such a competitive market the team needed the ability to change prices, re-list vehicles, all at the drop of the hat; something the old system took up to 48hrs to turn around. The solution was a bespoke CMS that would equip the sales and marketing function with a system that would be accessible for all levels of tech proficiency across desktop and mobile. To speed up the sales process and limit the administrative burden we built a feed that would push new listings live onto all classifieds sites in one upload. 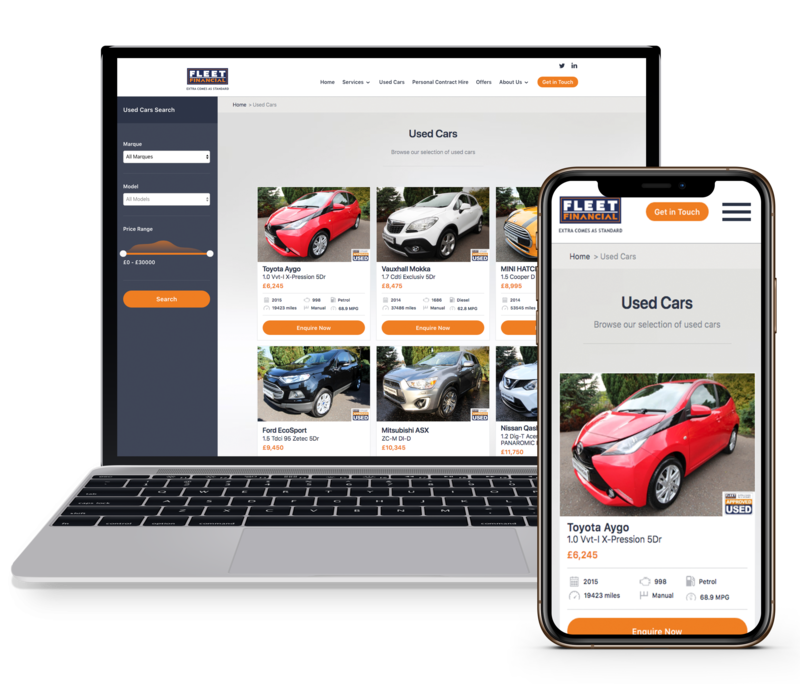 Previously the team used to have to upload all their individual car details to Motors.co.uk, Used Cars NI, Autotrader, and their own CMS - a very manual and time consuming process. Having worked with multiple classifieds sites we knew they used CAP HPI to provide their dataset - an extensive list of all cars in the UK and their specifications. We managed to create an FTP feed from a local classifieds site which meant the team only had to type in a registration number and upload their photos once and the upload would push to their own CMS along with every UK classified site they used. A process that used to take 48hrs now takes less than an hour. The logistic reality of acquiring a car is complex. A customer needs to think about finance, maintenance, breakdown, insurance, accident aftercare, and the legal setup required if you are managing a fleet within a business. This complexity brings an air of uncertainty on the buyers side which the Fleet Financial team are incredibly experienced and equipped at alleviating. This directed design to drive enquiries in every area possible in the understanding that a sales person is an essential element in the process and the sooner they are introduced, the higher the likelihood of a sale. We’re running a live event in early February in Belfast; How Digital Marketplaces Are Disrupting Global Automotive Commerce. The evolution from classifieds to online car sales and from ownership to usership is going to substantially disrupt the industry over the next 10 years. What's happening now across Europe, and what can we expect from the future?